True or false: America once invaded Russia. Nice try. The answer is true. Although few people know it, in 1918 President Woodrow Wilson sent 5,500 American soldiers — including some from Missouri and Kansas — to northern Russia in the last days of World War I. Thanks to harsh conditions that cut off communications, the troops were left there for eight months after the war ended. With dwindling supplies and no word from home, many wondered if their country had forgotten them. "Week follows week and November goes by and December. No word comes from the War Department. No word comes and the soldier is left to think that he has been abandoned and left to rot on the barren snow wastes of arctic Russia." But more than 90 years later these soldiers, known as the Polar Bears, have not been forgotten. California filmmaker Pamela Peak saw to that with her 2009 documentary "Voices of a Never Ending Dawn." Saturday, 20 descendants of the Polar Bears joined Peak for a free public screening of the Emmy-nominated film at the National World War I Museum at Liberty Memorial. Some planned to bring historic artifacts and photos, which will then be displayed at the museum. Visitors also can learn more by visiting the museum's display on the Polar Bears, officially known as the American North Russian Expeditionary Force. "It's perfect (to have a screening at the World War I Museum) because these guys never felt like they were a part of World War I," Peak said. "But they were." She should know. Her grandfather, Guy Campus, was there. He told stories of brave men fighting in waist-deep snow in temperatures that plunged to 60 below zero. The men's stories, many recorded in diaries, are all that's left. The last Polar Bear, Harold Gunnes, died in 2002 at 102. Their ordeal started after the U.S. Army's 85th Division arrived in Liverpool, England. Some regiments went to France while others, mostly from Michigan, boarded ships bound for the Arctic Circle. "President Woodrow Wilson was pressured by the British to send American soldiers to Russia to fight a new force called the Bolsheviks, an early name for Communists," Peak said. "Winston Churchill (then Britain's secretary of war) saw that the Bolsheviks were pulling the czar's forces — our allies — out of the war as they were taking over Russia. So Churchill got this bright idea that if we could amass forces in northern Russia, we could stop communism at its birth." The Brits assured a conflicted Wilson that the American soldiers were needed only to guard supplies. When the men arrived, they discovered the Bolsheviks had stolen all the supplies. With nothing to guard, the men were put under British control and sent to fight in bone-chilling cold. Even their voyage to Russia proved difficult, Peak said. A couple of dozen died of influenza on the way. "There was a horrible lack of medical supplies on the British-packed ship," Peak said. "The Americans went looking for medical supplies, but all they could find was case after case of British rum." The American soldiers, along with 3,500 men from allied countries, made their base in Arkhangelsk, Russia, 600 miles north of Moscow. They survived by building block houses with small slots for their rifles. Some soldiers who spent nights outside on watch died of exposure. Although the war ended 60 days after the soldiers arrived, none of them knew it. "This was two years before the first radio station," Peak said. 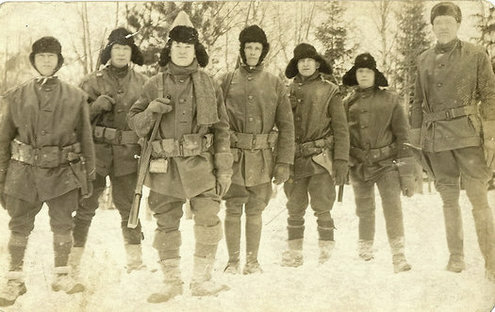 "Once the seas froze over in late October or early November of 1918, there was no communication getting in or out, and these guys were totally cut off." As a result, the soldiers remained in Russia. Back home, their families grew frustrated. As other men returned home from the war, the Polar Bears' families couldn't get information about their sons. "They were the first American citizens ever to patriotically petition their own government to bring their sons home," Peak said. "They actually changed foreign policy because they finally brought their sons home in late June and early July of 1919." The soldiers became one of the most decorated units in World War I, Peak said, although the story of their service was largely swept away by the politics of the Cold War. The story was so hidden, Peak said, even former presidents Richard Nixon and Ronald Reagan didn't know it had happened. However, Peak said, schoolchildren in Russia were taught that America invaded Russia. Mike Grobbel of Shelby Township, Mich., is one of the descendants coming to Kansas City this weekend. The military awarded his grandfather Clement Grobbel the Distinguished Service Cross, the nation's second highest military honor for extreme gallantry and risk of life in combat. Grobbel, who runs a Polar Bear Memorial Association website, is bringing a trench shovel that was buried for 90 years and found in 2008. Peak got a good portion of the $200,000 she needed for her "budget film" from her cousin, Sgt. Major Larry S. Chase, who lives in Troy, Mich., home of the official Polar Bear monument and memorial. She raised the rest by speaking to veterans groups. The film is told largely with words from the soldiers' diaries. It began airing on public television stations last Memorial Day. "This is not a dry war documentary," Peak said. "I wanted people to see the human side." © 2010 McClatchyDC.com, 700 12th Street NW Suite 1000, Washington D.C., 20005.